The Box Hill Hawks are thrilled to announce the signing of West Perth star, Luke Meadows, for the 2019 VFL season. Meadows’ name has been on AFL draft radars after a breakout year in 2016 saw him burst onto the scene; playing the role of an attacking half-back who proved near impossible to beat in a one-on-one contest. Since then, the now 24-year-old has dominated the West Australian Football League (WAFL), and crosses to City Oval off the back of his best season yet – averaging 25 disposals and five tackles, to finish in the top 10 of the Sandover Medal. While playing the vast majority of his 90-match WAFL career across the backline, a move into the midfield elevated Meadows’ game to the next level. The switch allowing the elite ball user to make the most of his disposal, while a 185cm frame and strong body aided his ability to win contested possession. Meadows was regularly amongst the best for this year’s grand finalists, West Perth, and will now enter the VFL with a point to prove, after not getting picked up in the AFL national and rookie drafts, in the face of such a dominant season. Despite being overlooked, Meadows believes he has what it takes to make it at the highest level, and a strong year could just place him in contention for a mature age pick-up. 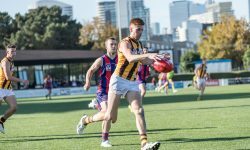 Regardless, Meadows has earmarked 2019 as a year for personal growth and after fierce competition for his coveted signature, the Hawks couldn’t be happier that he’s chosen City Oval as home.